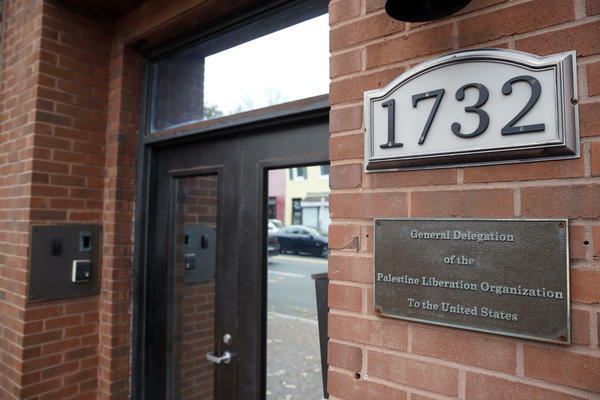 The Washington office of the Palestine Liberation Organization, which is now set to close. Husam Zomlot, the head of the Palestinian delegation to the U.S., said that they are "not surprised." "Such a reckless act confirms that the administration is blindly executing Israel's 'wish list,' which starts with shutting down Palestinian diplomatic representation in the US," he said in a statement. Palestinian negotiator Saeb Erekat described the decision as "yet another affirmation of the Trump Administration's policy to collectively punish the Palestinian people." He vowed to "protect the rights of our citizens living in the United States to access their consular services." The PLO has been calling on the International Criminal Court to open an investigation into actions by Israel. In her statement, Nauert called the decision consistent with concerns about "Palestinian attempts to prompt an investigation of Israel by the International Criminal Court." The closure is part of a series of steps the U.S. has taken that have been blows to the Palestinians. In May, the U.S. officially moved its embassy to Jerusalem. As NPR's Bill Chappell reported, Jerusalem is "a city that is claimed by both Israelis and Palestinians, and the status of which has long been regarded by America's biggest allies as an issue best resolved in multilateral peace talks." The U.S. also officially recognized Jerusalem as Israel's capital. The U.S. also has cut off major sources of aid to the Palestinians, freezing most of the $251 million earmarked for Palestinians this year after Palestinian officials protested the recognition of Jerusalem, NPR's Daniel Estrin has reported. Additionally, the Trump administration has "withheld $300 million to the United Nations agency that cares for Palestinian refugees."